Fans of GURPS Dungeon Fantasy love taking their heroes to new and unexpected realms. Yet sometimes we go to even bolder territories with Dungeon Fantasy itself, pushing the envelope in strange, exciting new ways. 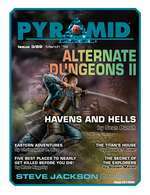 To that end, we proudly present Pyramid #3/89: Alternate Dungeons II, following in the tradition of the first volume released a couple of years ago. This issue features Sean Punch's supplement-length campaign setting "Havens and Hells," a realm where adventurers can't die, money doesn't exist, and the stakes for hack-and-slash adventurers have never been higher. Can the heroes protect their realms of tranquility, and perhaps ultimately uncover the secret that underpins the entire cosmos? Alternate Dungeons II also provides Christopher R. Rice's expanded look at Eastern adventures, with revised templates, new advantages, two new humanoid races, power-ups, and much more. Add these elements to an existing Dungeon Fantasy campaign along with martial artists and ninja assassins, or use them as the basis for an entirely different-feeling campaign! This issue also includes David L. Pulver's epic adventure set in the colossal house of a titan, another new vignette set in the forthcoming Car Wars setting, and more. With Pyramid #3/89: Alternate Dungeons II, you'll get more treasure in one issue than in a trunk of hard-won gold! Pick it up individually, or subscribe to Pyramid today and get fresh deliveries of new gaming goodness every month!